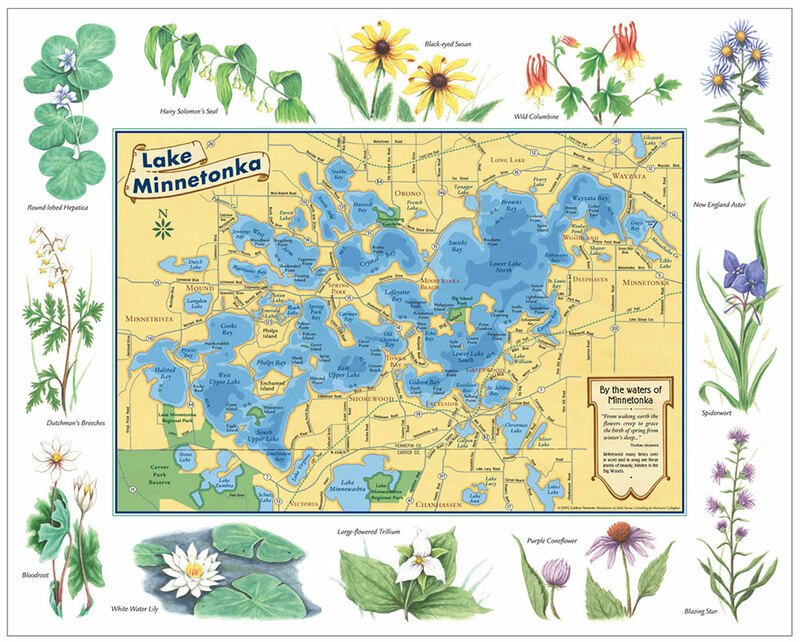 Expertly crafted illustrations in any style, from oversized to small, for magazines, books, museums, educational materials, park visitor centers, nature centers, public institutions, retail, advertising, and more. 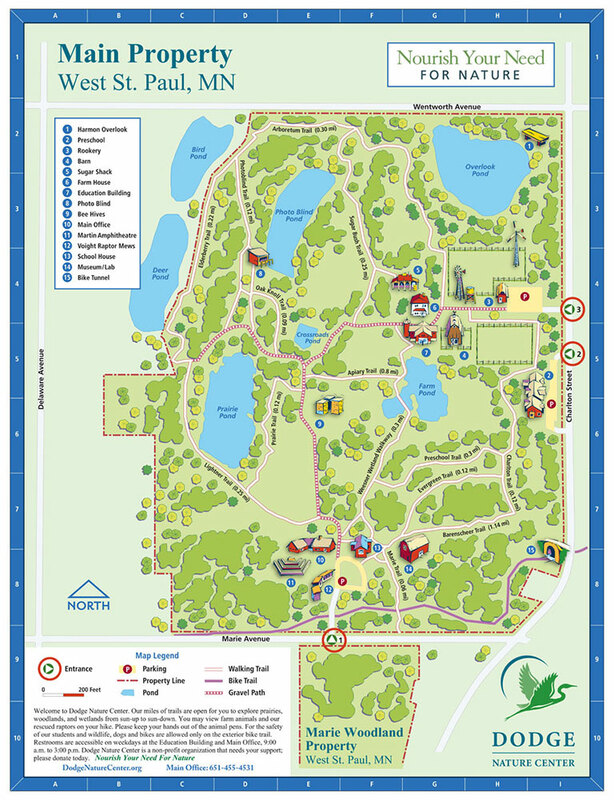 A full color illustrated map of the Dodge Nature Center, an environmental education campus in the Minneapolis–St. Paul metro area. 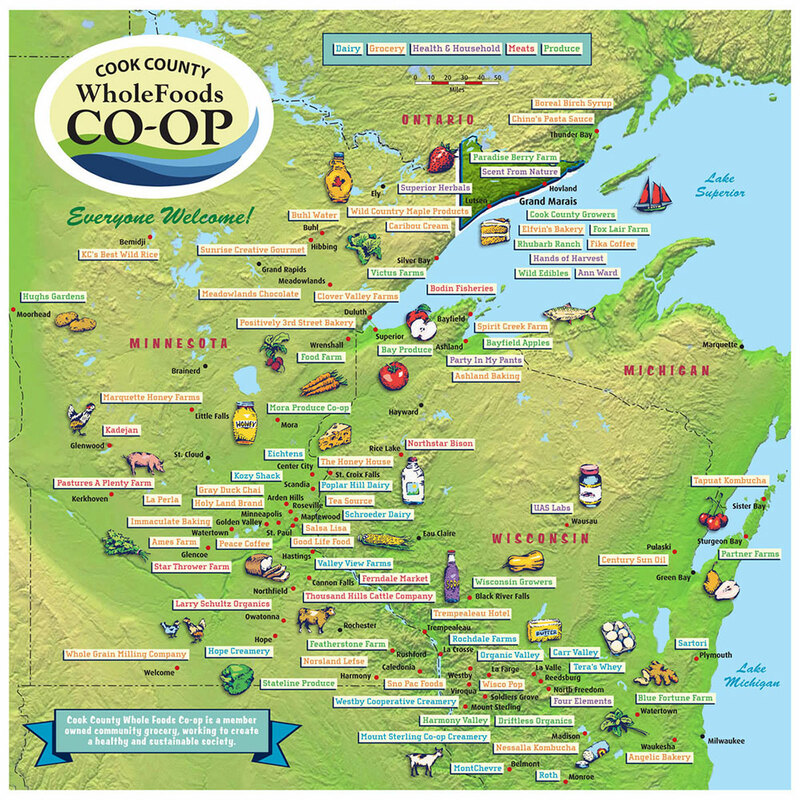 This map was produced for kiosks, for printed distribution and as an online downloadable guide. 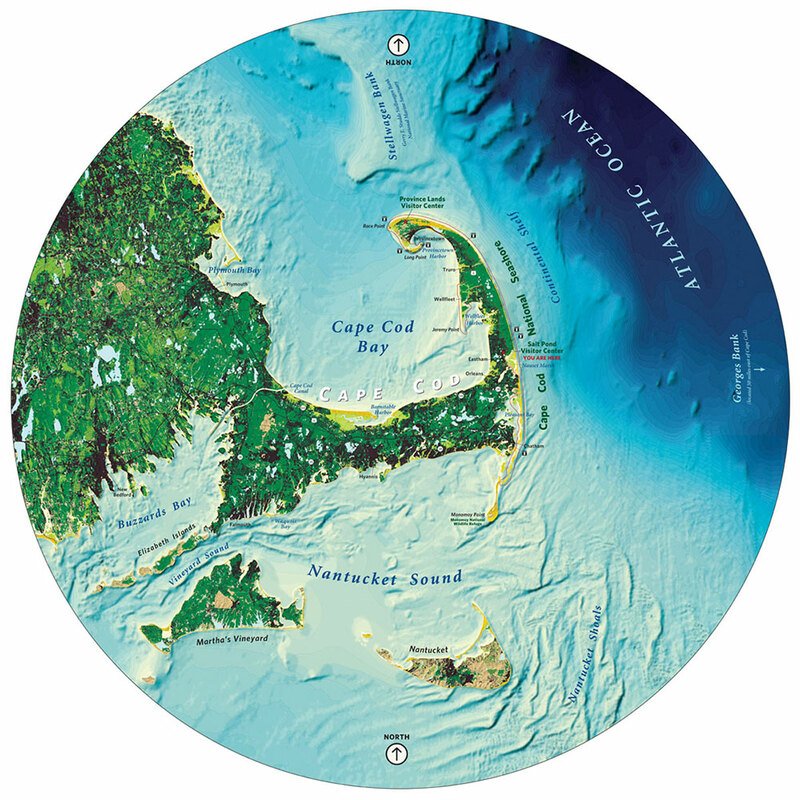 A giant walk-around interpretive map – at the Salt Pond Visitor Center of Cape Cod National Seashore. Eight feet in diameter, in fact! 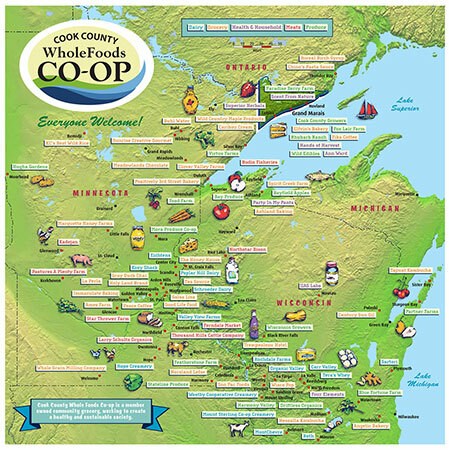 An informative wall display installed within the entryway of a whole foods cooperative – promoting the idea of local grown food sourcing. 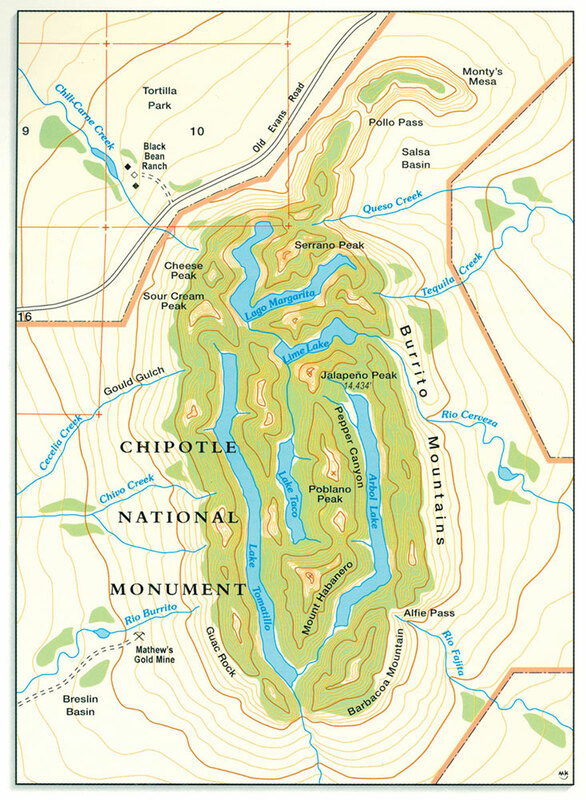 A monument to delectable burritos and tacos? In reality, a custom map illustration designed to advertise the legacy of Chipotle Mexican Grill. 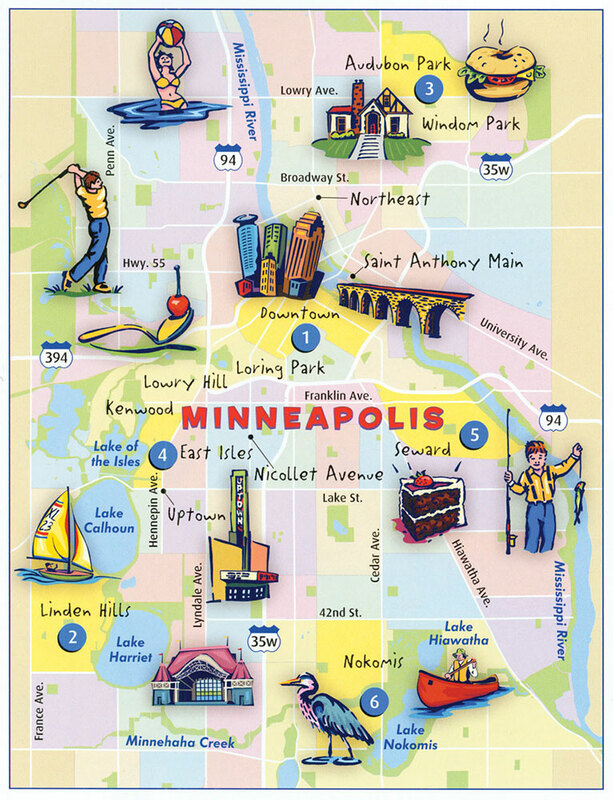 What a great place to live and play – Minneapolis. 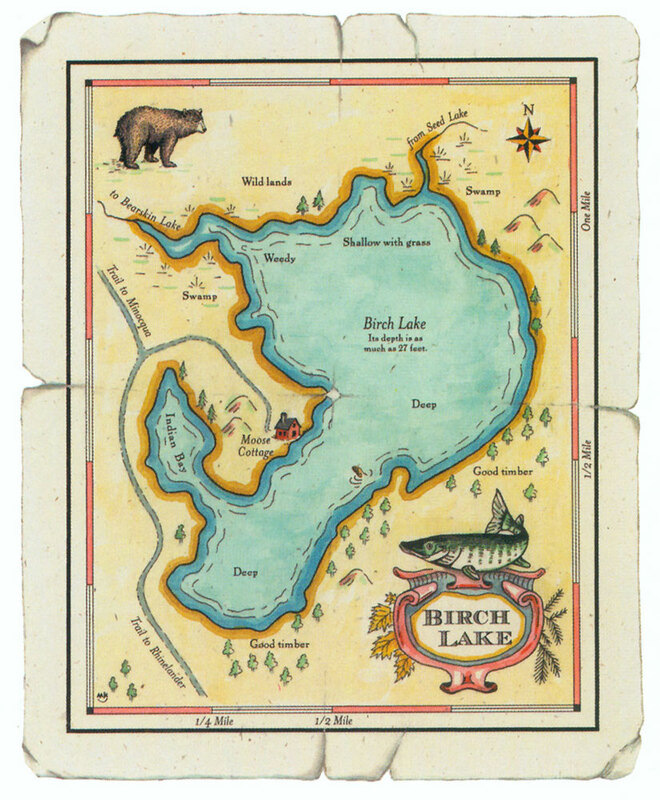 As promoted via map and illustrations in You Are Here city magazine. A serious moment in American history deserves a serious and thoughtful map depiction. 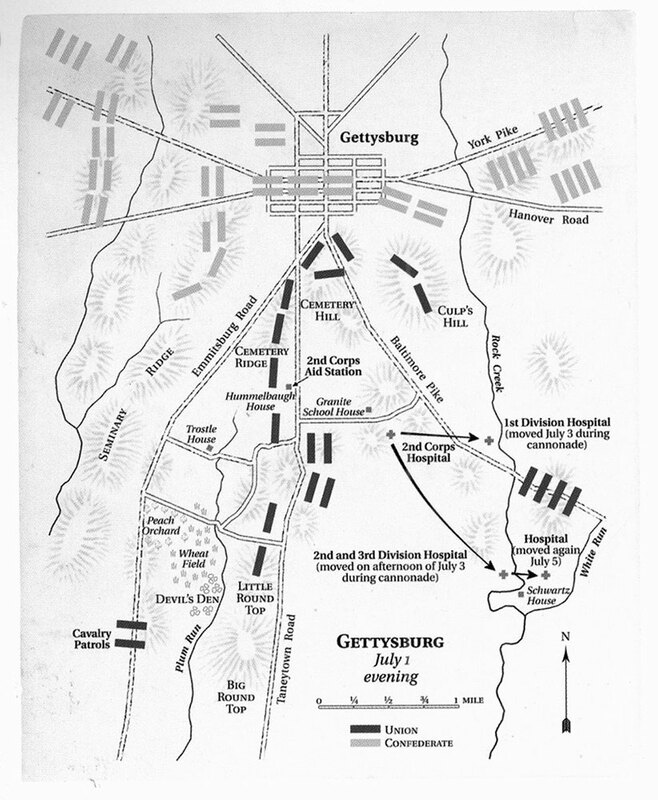 For an award-winning book on the Civil War, published by the Minnesota Historical Society. Need to tell the story of a faraway place and make it seem right next door? A detailed map illustration is a good place to start. 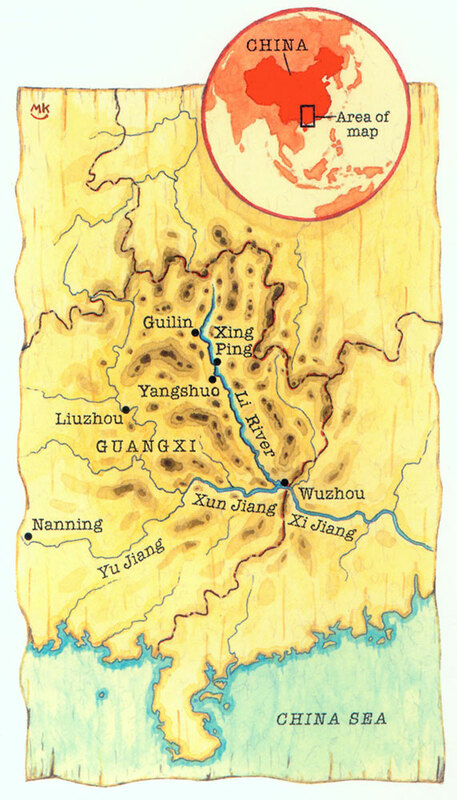 Where in the world is Guangxi? 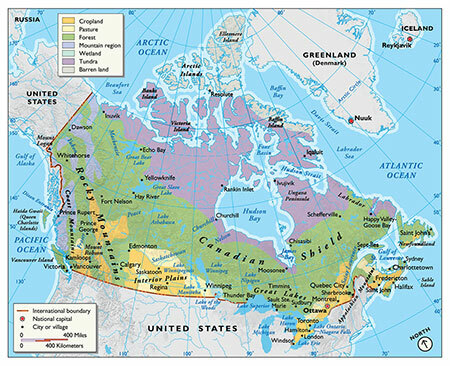 It’s right where this map puts it! 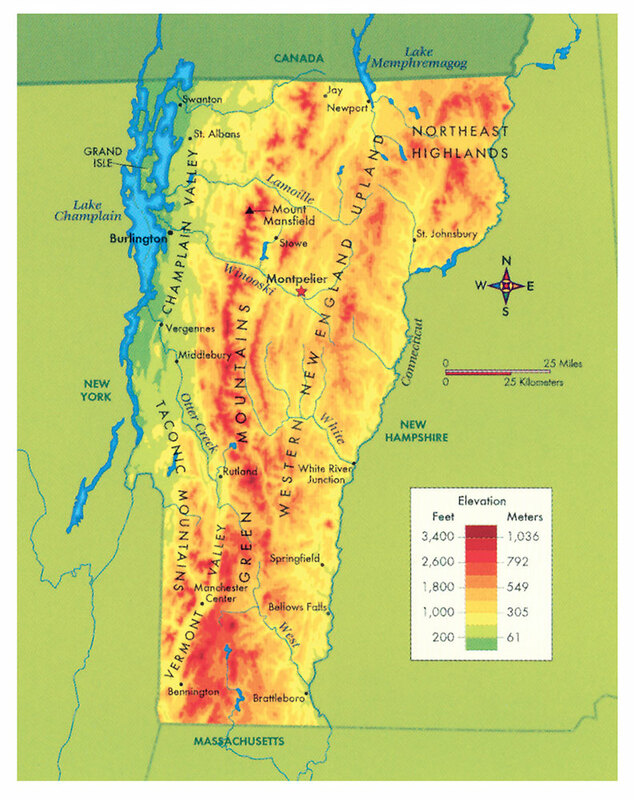 The mountainous terrain of Vermont. Just one example of a thematic map designed for America the Beautiful state series, produced as a resource for K-12 students. Beautiful wildflowers surround this renowned Lake Minnetonka near Minneapolis. This accurately mapped and classically illustrated keepsake poster (and collectable notecards) pays homage. Most of the world's greatest explorers took great joy in sharing the stories and details of their adventures. 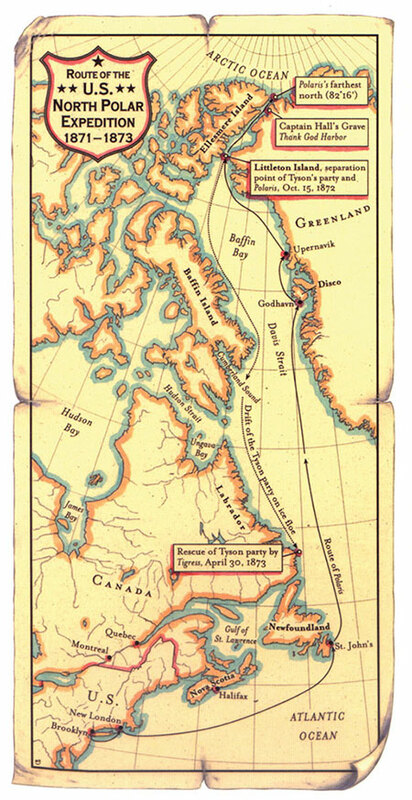 You can almost picture a veteran of the North Polar Expedition tracing a finger along this map to tell a tale about his remarkable voyage to the Arctic in the Nineteenth Century. Map icons can be carefully crafted to illustrate a sense of place, an event, or a character. 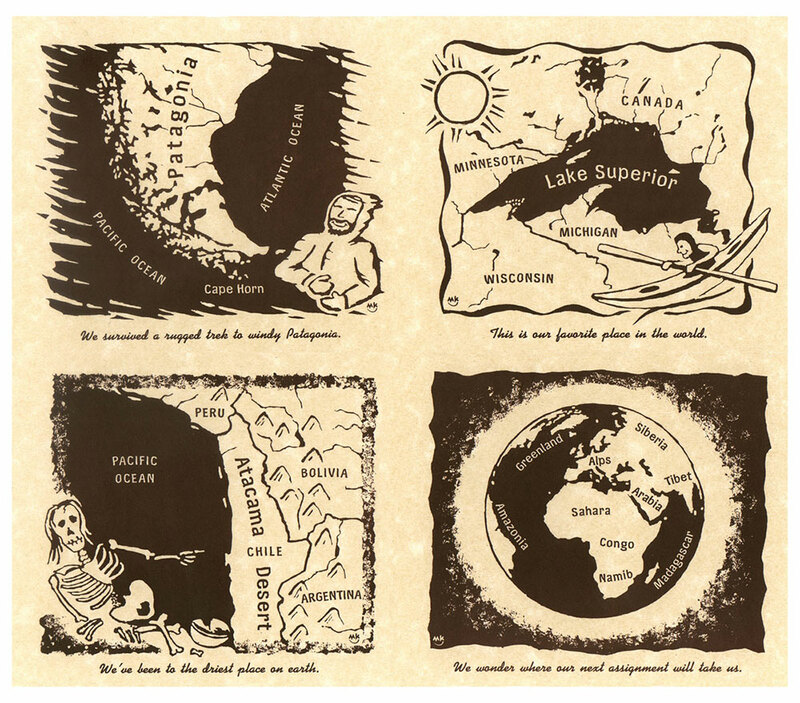 Integrate them with a map, then stories can begin to unfold for a reader. 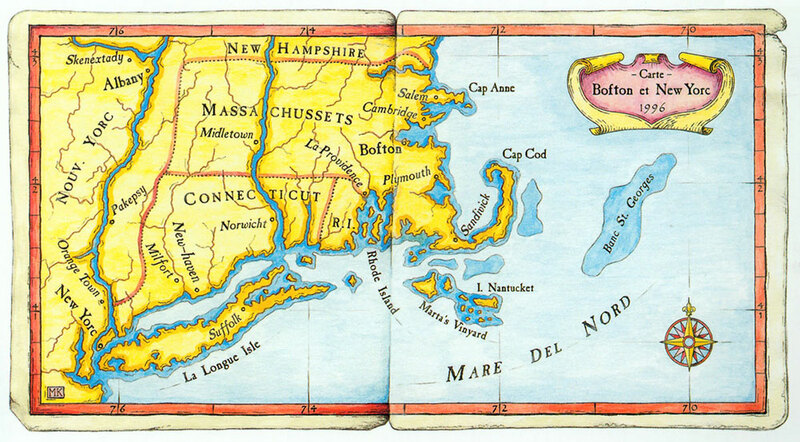 Welcome to the U.S.A., a state series made more enticing with the use of illustrated maps. The perfect getaway – or hideaway? In either case, a map illustration reinforces the place. 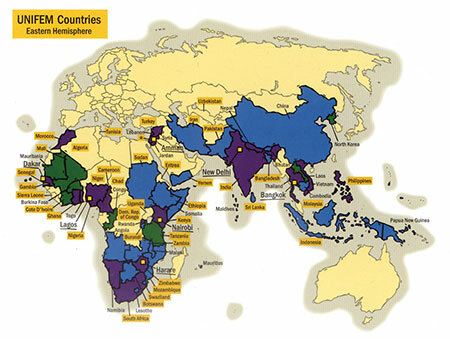 The United Nations Development Fund for Women. 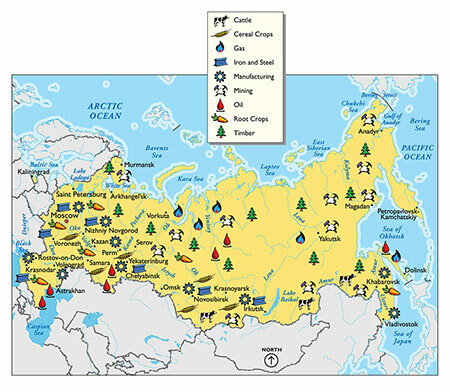 Illustrating key projects across the Eastern Hemisphere – as shown in a United Nations annual report. 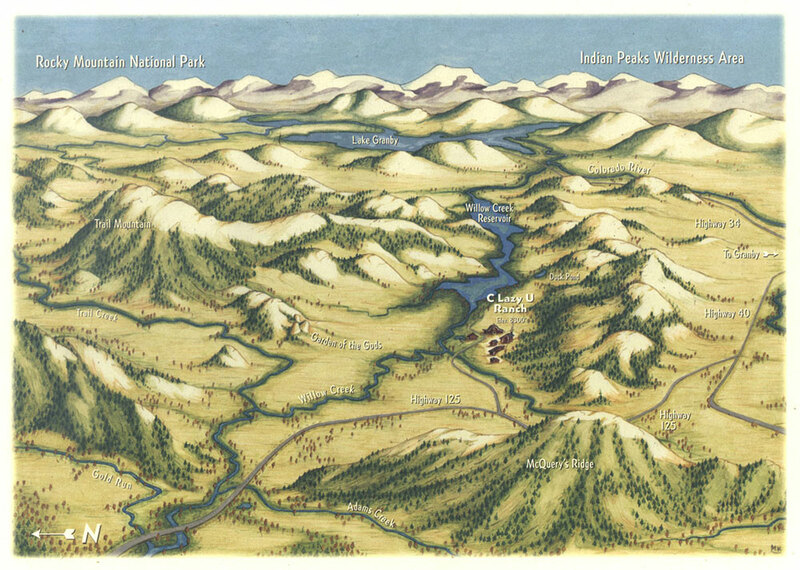 A visitors map guide to Chief Joseph Dam on the Columbia River. Critters and camping await! A bird’s eye view of an upscale dude ranch near Lake Granby, Colorado. More specifically “Das Waldsee BioHaus”. 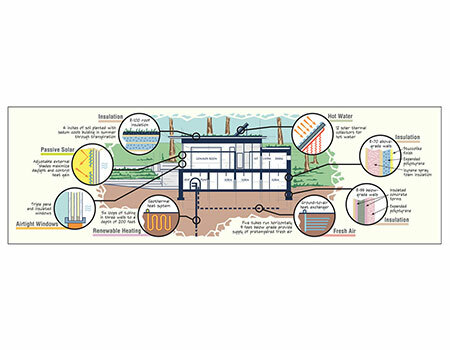 A map as a diagram – showing the ins and outs of a modern ‘green’ building and its merits for smart living. 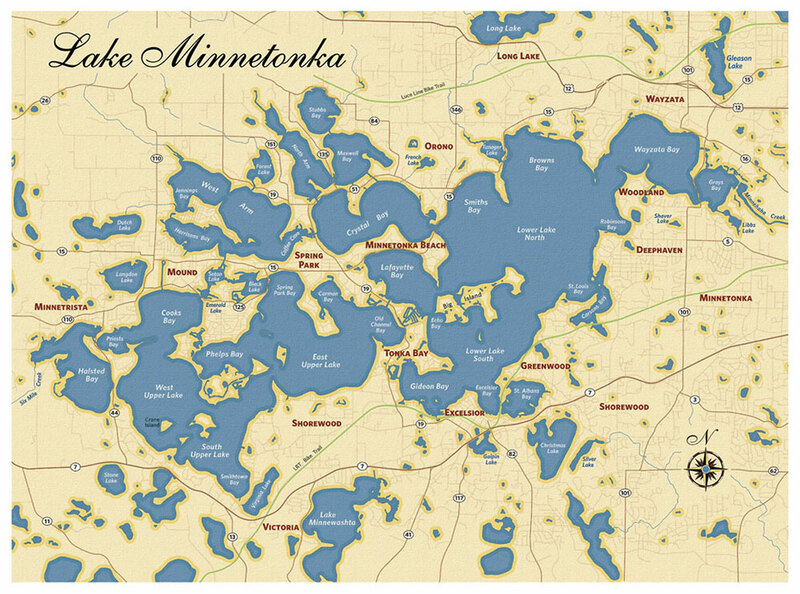 Appealing to the eye, beckoning for further close study, and full of accurate and interesting details – this map was used in the book Legendary Homes of Lake Minnetonka about the notable estates surrounding this magnificent lake, published by Minnesota Historical Society Press. 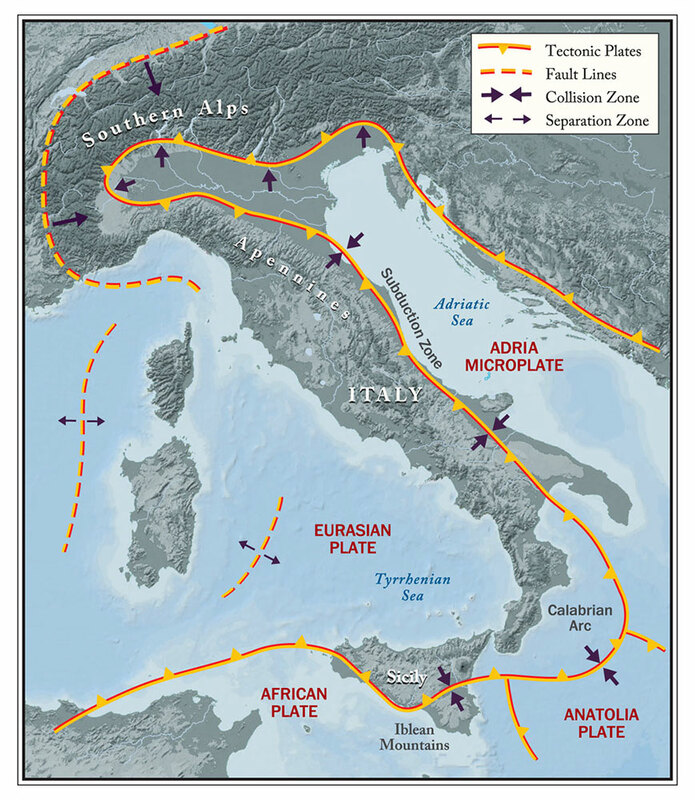 One of a suite of maps depicting the unique geology of Italy and the historic consequences of its position in the Mediterranean – in the book Tweeting Da Vinci by Ann Pizzorusso. 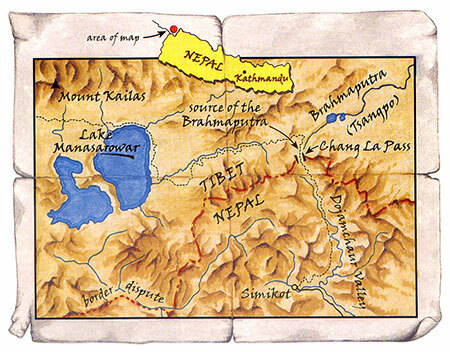 Take a ride down the Mekong – in the form of a map. 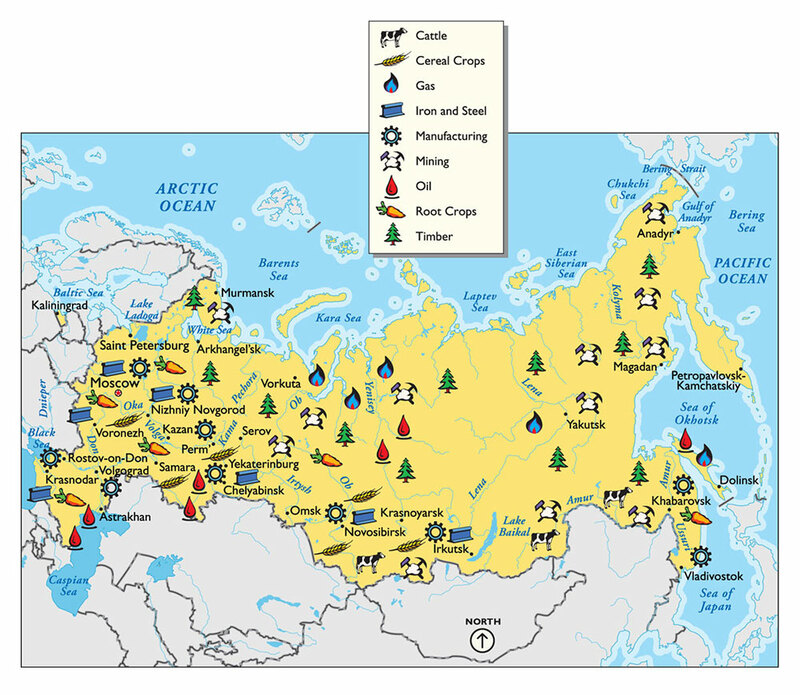 A textbook example of a map that communicates about a place. A purely educational piece. One of the more unique and beautiful wilderness areas in the world. A vast area of pristine lakes and bogs interspersed with land and wildness. 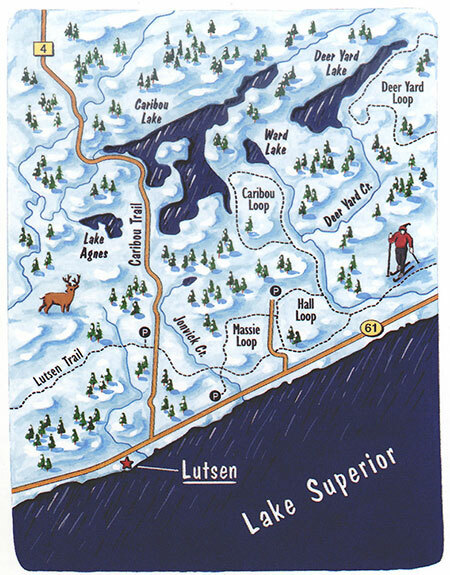 The North Shore of Lake Superior is a winter wonderland - a paradise for cross-country and downhill skiing, winter trekking, ice fishing, snowmobiling, and more. This simple yet evocative season-oriented map helped a tourism association to promote their message of winter-time fun. 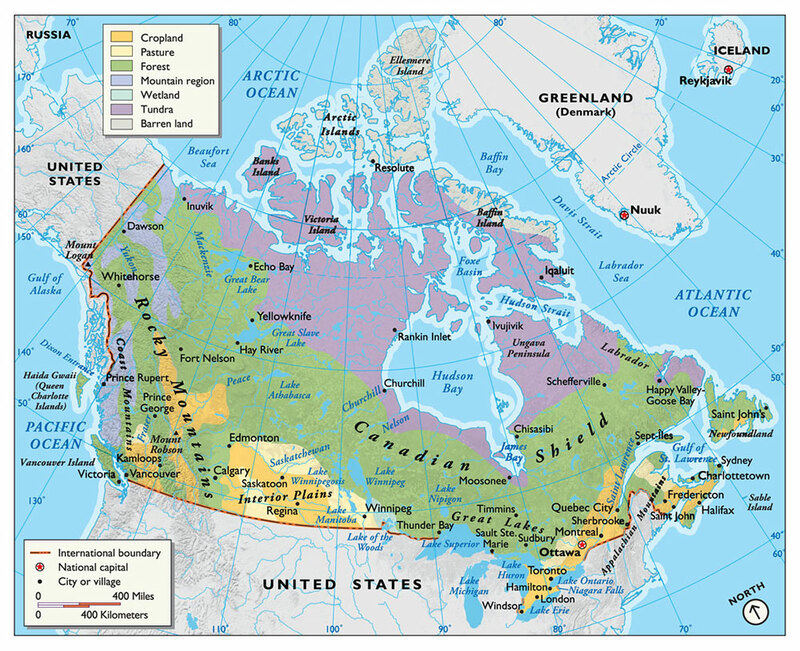 From tundra to pasture – a carefully crafted map depiction of Canada’s ecological regions. A textbook example of a textbook map. 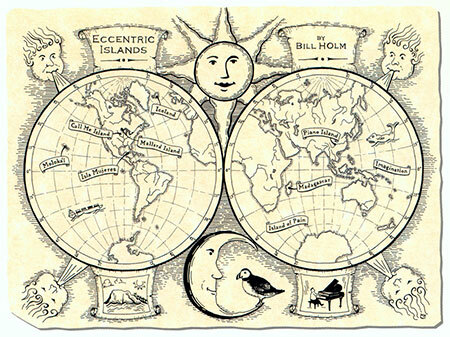 This map is one of several created for a book about Eccentric Islands, both real and imaginary. 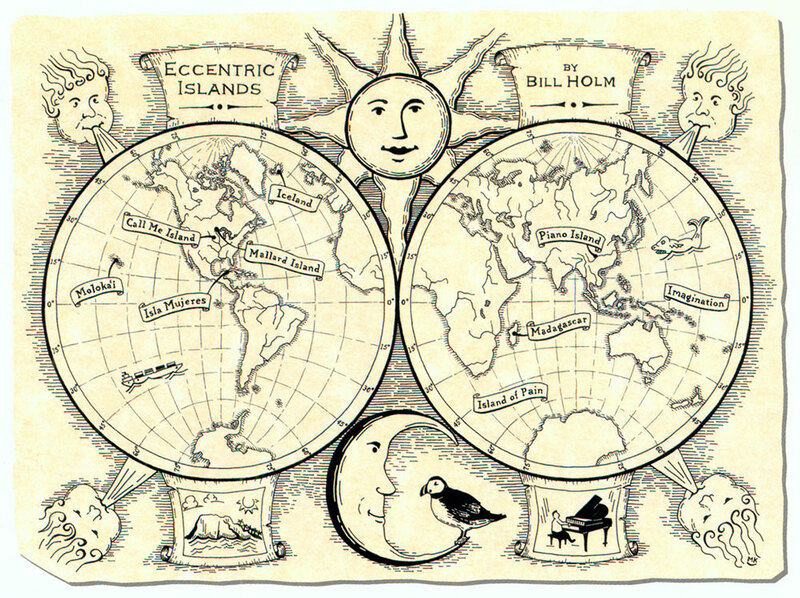 It is a fine-lined, hand-inked illustration that was intended to help the book's readers find their way through the author's winding and well-told journey. A common image doesn't have to be commonplace. 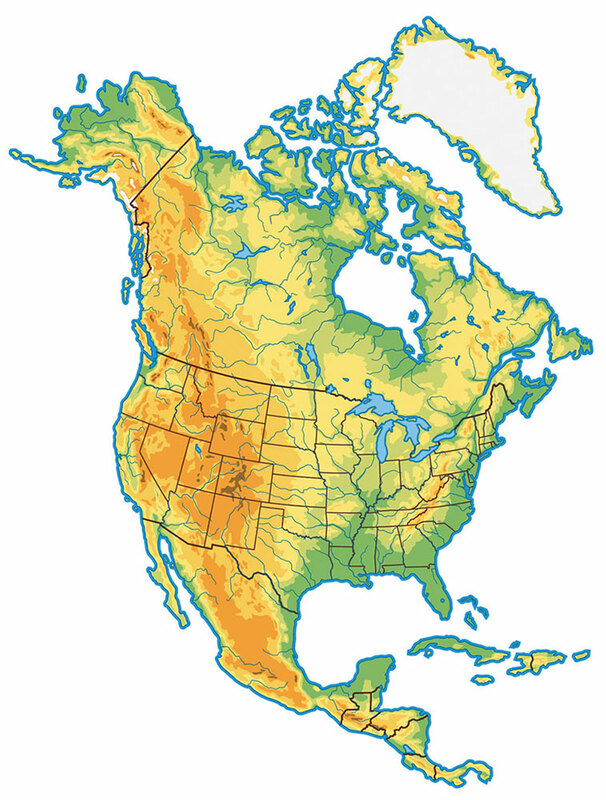 Here is a classic depiction of the North American continent, showing mountains, river valleys, coastal features, and country (and U.S. state) borders. 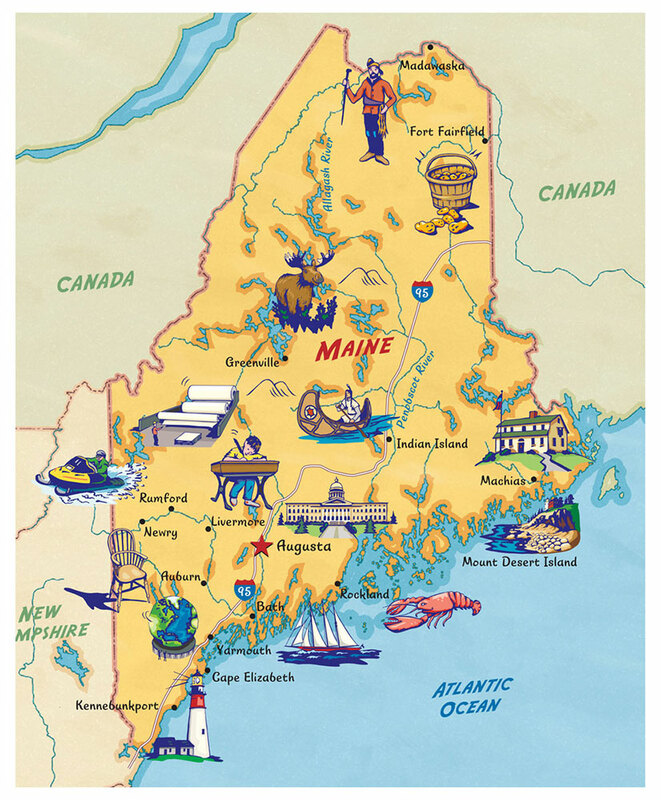 The land where the Pilgrims began their progress. This map was designed to show the New World in an Old World style. 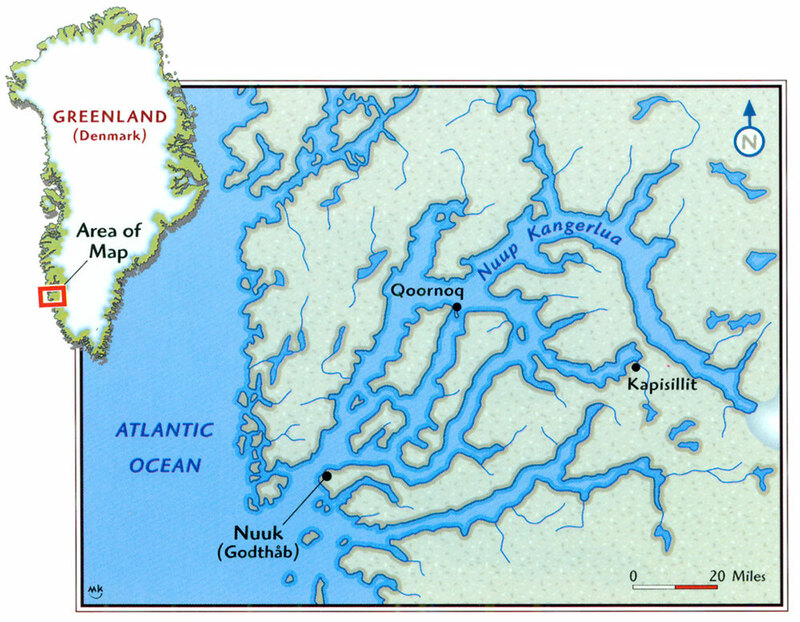 This type of map works well in color and in black and white, for magazines and books. Real journeys and worldly experiences – brought to life through the use of illustrated maps. The illustration style used works great in both black-and-white or in color. 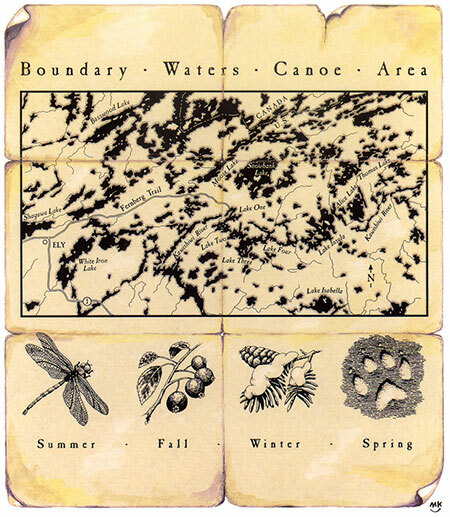 It's a perfect style for adventure travel books or outdoor magazines. 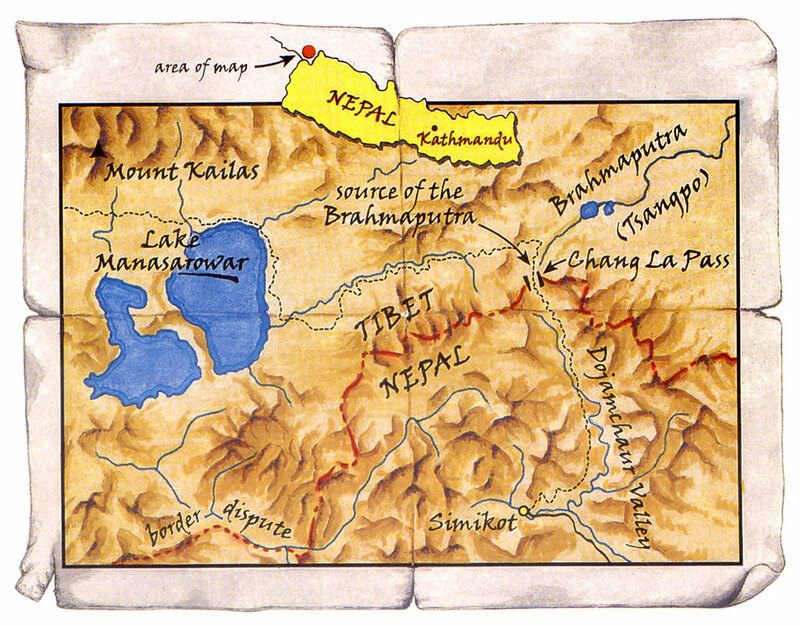 This shaded relief map of the Himalayan land between southern Tibet and northern Nepal was meant to spark interest in a land that has long inspired adventure travelers and writers. The map's appearance helps convey the historic fascination with the area.